Surprisingly, as the chart below shows, expensive washable filters are more similar to fiberglass filters in their ability to capture microparticles. These filters are typically designed to be washed out monthly and reused. 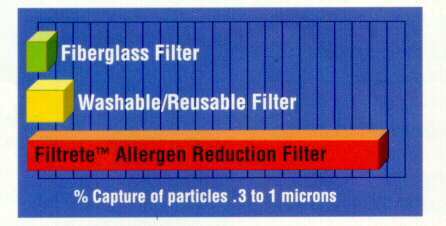 Tests show that this type of filter is not very effective at capturing the smaller, respirable particles from the air. Respirable particles are those that are inhaled into the lungs and can cause respiratory problems. Although some brands claim to have an electrostatic charge created by air movement through the media, the charge is minimal and plays little or no role in particle capture. This type of static charge is similar to the one created when combing your hair during winter or dry seasons. However, the charge in these filters is not permanent and can vary with temperature and humidity levels. The electrostatic fibers in Filtreteä air filters are permanently charged. These patented fibers are embedded in the filter media, which attract and retain more of the micro particles in your home's air that can aggravate allergies and irritate your respiratory system. They act like magnets to remove airborne allergens, such as pet dander, mold and bacteria, as well as micro particles such as smoke and dust. That's why Filtrete ä filters outperform ordinary fiberglass and pleated filters, delivering up to 3 months of filtering performance. The initial efficiency of the Filtreteä Micro Particle and Airborne Reduction Filter from 3M is the next best thing to an electronic air cleaner at a fraction of the cost. Plus, there is no maintenance or cleaning necessary. When it says "Filtreteä " on the label, you can be assured you're using the best filter for your family.